Subscription boxes are quite popular these days and Your Bijoux Box pushes the concept forward delivering 2 -3 pieces of hand curated on trend jewelry straight to your door every month. I received the October Bijoux Box. Read on to see what I thought. The Box: The shipping box provides a clean presentation for the contents which come wrapped in tissue paper like a present. The jewelry is individually packaged in black velvet bags along with a card that describes the contents and offers a few styling suggestions for the pieces. I was an instant fan of this gold overlay and cream colored clover necklace since it has a elegant feel and the style is reminiscent of vintage Chanel to me. I liked the earrings a little less. Dangly styles aren't really my thing but I would wear these for an evening out. 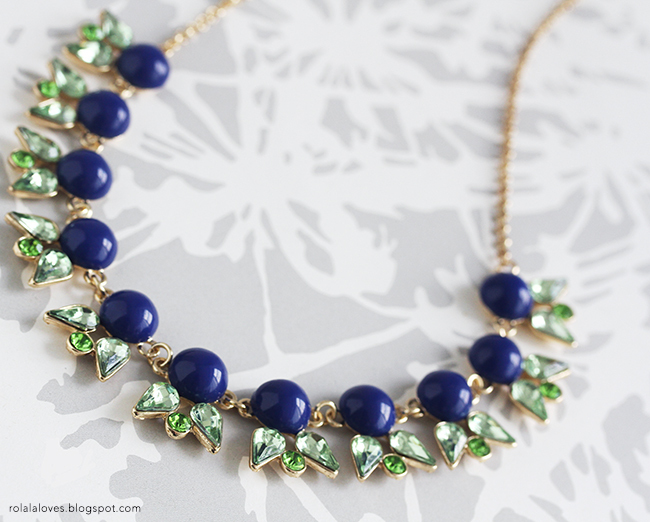 The jewel tones of this bold necklace are quite pretty and suitable for fall. I don't usually go for chunky colorful jewelry like this since I tend to favor bright color and bold prints in my clothing but this is a striking statement piece that I could see wearing to dress up simpler tops or to add a pop to monochromatic outfits. The Gilded Clover Necklace was my favorite piece since it suits my taste and can be versatilely styled. I did find it nice that a piece like the Cabochon Petals Necklace was included because it gave me a chance to try out a style I wouldn't necessarily pick out for myself. $35 for this box is a good value as I could see one of these pieces alone retailing for that price. What's cool about how it comes packaged is that you can easily gift one of the pieces if you wanted to. If you're a fan of fashion forward jewelry and the feeling of receiving a gift every month, Your Bijoux Box is probably right up your alley. I would say that if you tend to prefer more classic and delicate jewelry styles, it may not as good a match but then again it could help you step out of the box with your usual jewelry styles. The flexible subscription options of this service make it really easy to try it out for yourself. They also offer gift subscriptions. With the holidays just around the corner, this could be a fantastic gift idea for any jewelry lovers or fashionistas in your life. 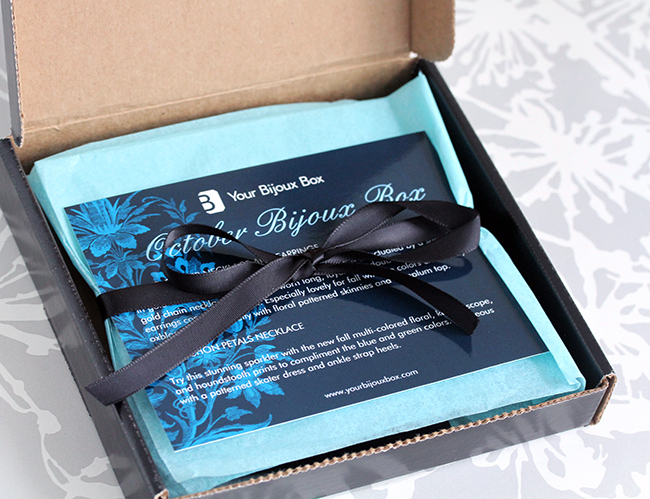 If you're interested in subscribing or learning more about Your Bijoux Box, visit their website. Use the code SPARKLES to receive a free piece with your new subscription. What's your jewelry style? Would you sign up for a jewelry subscription box service? Disclosure: I was sent a complimentary box for the purposes of this review. I was not provided any other compensation and all opinions are 100% my own. Doll you got beautiful accessories love it. Have a great day. I didn't know that are bijoux boxes too. In my opinion it's more interesting than a beauty box. The two necklaces are gorgeous! Ooh the cabochon/VCA-esque earrings are really cute! I am picky about jewelry but would try out a few orders! i am actually much drawn to the cabochon necklace although it is not the style i'd normally wear. it is something i'd be interested in subscribing. and i agree with you on that it would make a nice gift! For $35! That's super awesome Rowena. I love all 3 pieces and that last piece is spectacular. A company wanted to send me a free box and after looking at their past boxes I said noooo way! hahaha It was junk. So I was always leery about these. There's is excellent. Thanks for the review. Have a great week. This jewelry is super pretty. I love every piece you received and I think $35 is a great bargain. I'm not much of a jewelry person so I could never subscribe to anything like this, but that petals necklace is so lovely. Really pretty! I love that second necklace, the colors are amazing! This is the first time I have heard of a box that gives jewelry. It is a really interesting concept and I like it. The gilded clover is my favorite piece. It is pretty! Those are some beautiful jewelry pieces. I need to get on board, I still haven't and I don't know why. there are boxes for everything now! that is a real steal - getting those beautiful pieces for $35 a month. 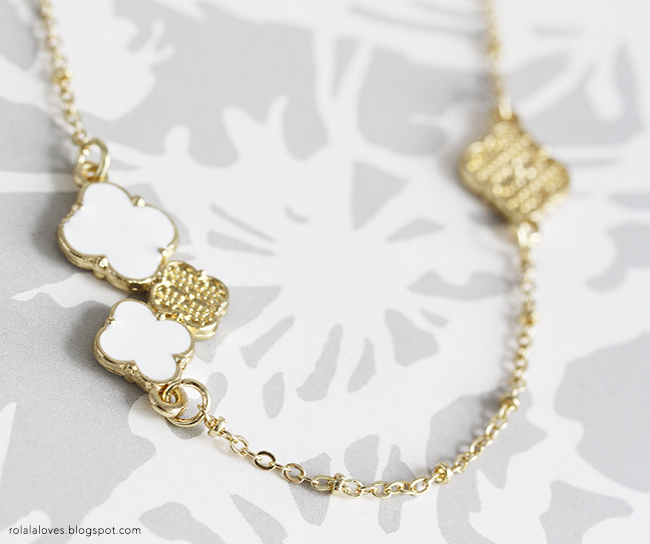 the gilded clover necklace is a stunner! WOW, this bijoux box is amazing ! In love with the necklace! This would make a wonderful gift. Good idea for the holidays. 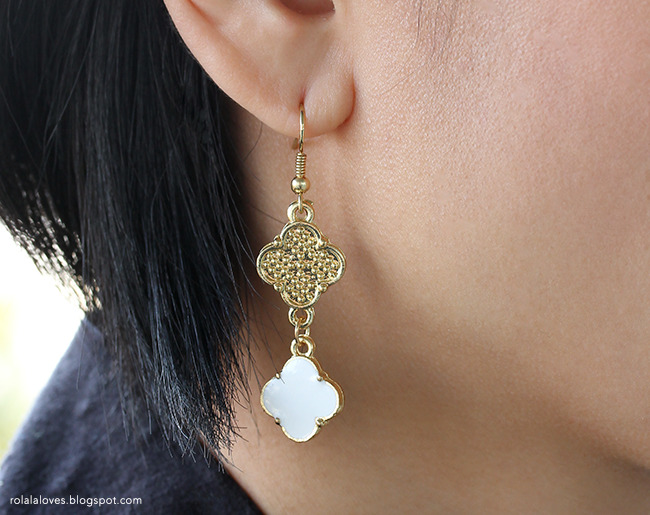 Yeah, I really really like the clover necklace too, but not really a fan of dangly earrings. I actually think the earrings would have worked better as studs! I doubt I'd sign up for a jewelry subscription service, although it is nice to have access to pieces you wouldn't normally find in stores! So this is kind of like a Birchbox? I just got a subscription to Birchbox and love it! This looks like they send good stuff too! Love what you got! Really great bijoux girl! Keep on this way, good luck! Thanks Kizzy! I definitely like the idea of trying styles I wouldn't usually pick. Same to you! I agree, that necklace would look great on an all black look. Thanks and to you as well Lilli! It's nice that they have month to month options. Yes I think this could be a great gift option for the holidays. The quality for $35 was definitely there. I think you can even see it in the photos. Bummer that this other company was junk. Thanks! You too Kim! This was actually my first subscription box and it was really fun to open up the box to discover pretty jewelry. For what you get, I really think it is. Such lovely packaging! I've been seeing a lot of these monthly subscription boxes, seems like there is something for everyone. I especially like this because I'm constantly complaining about how I don't have enough accessories to go with my outfits. Must be so nice to receive such a box. just perfect for the jewelry fanatic! This is very beautiful jewelry set. I wish I could wear Jewelry often. I think I'm going to make it a new year resolution to start to wear jewelries more often. Nice jewelry!! I love the necklace!! Subscription boxes are so much fun! You got some great pieces in this one - my favorite is the statement necklace! This is such a great idea, I wish we had something like this here in SA, the necklaces are so pretty. It is a steal for what you actually get! I'm loving that necklace. Hmm I think you're about about those earrings working better as studs. I know I'd probably wear them more. It is a nice idea to be able to get jewelry you wouldn't get elsewhere. Yes it's pretty much like Birchbox but instead of beauty products you get jewelry. I'm so tempted by Birchbox. OMG I love that first necklace! The idea of getting new jewelry delivered to my doorstep every month is appealing, but how would I find time to wear it all! Hmm...maybe that is a good problem, though! I used to look forward to subscription boxes arriving every month too. But jewellery every month! That's a whole other level of luxury to enjoy! I read about many subscription boxes but never one which sends accessories to your doorstep. The price of $35 is great as I could see how well-made these pieces are and that one piece could easily cost that price. Also, the packaging and how the pieces came with velvet bags and cards on how to style them, I think these are little details which consumers would appreciate a lot. The white and gold piece also reminds me of Chanel! And LV too coz of the flower. I keep wanting to sign up for one of these but I am weary. Looks like you received wonderful items here, I just may have to check this one out! Great review! !